Good morning! Look at that - I'm actually getting a post out for the morning! Things are beginning to get back to normal in our house now. Still busy but not crazy. 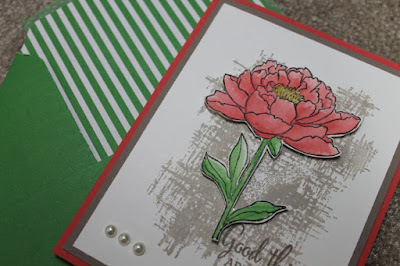 Today I'm sharing a gorgeous Happy Mail card I received. I'm not sure who made it but it's beautiful! I love it! It uses a new set called You've Got This (p. 113). I love the background in this set and can see using this on lots of things. It also showcases 4 of the new in colors - Watermelon Wonder, Cucumber Crush, Tip Top Taupe and Delightful Dijon. 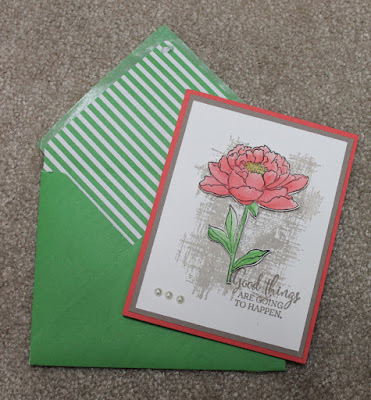 And check out the envelope - it was made using our new envelope paper! This paper is the PERFECT weight for envelopes and solid color on one side and patterned on the other. Still today and tomorrow to take advantage of the Virtual BOGO Event. All the details are in this post.